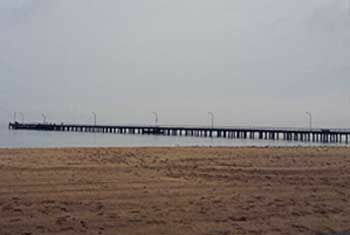 Adam Lentini recently fished the Altona Pier. The weather conditions were drizzling and zero wind which had the bay looking more like a swimming Pool. Adam fished the run of high tide catching a totoal of 5 Salmon between 26 to 28 cm. All were caught flicking metal jigs and spoons to passing schools of Salmon. Adam’s preferred lure was the Gillies 15 gram pilchard replica. The gear of choice was a Daiwa deep striker 7 foot model 3 – 5 kilo capacity fitted with a Daiwa Lexa 2500sh spin reel and spooler with 10lb braid and leader. Thanks for the detailed report Adam.